After having a big rethink regarding the shape of Zenith, I decided to move away form the Nightmare-style design I had before. 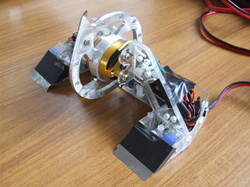 While I wanted to keep the premise of the design the same (that the wheels were near the front and there was a large space underneath the disk with nothing occupying it), the shape was unreliable, hard to make strong enough, hard to fit in the cube, easily toppled, and hard to fit all the components onto without them being horribly exposed. After doing 3 or 4 different CADs with the Nightmare design, I scrapped it and started playing with the idea of having a short VDD/DBA style body, but with the front still having the Nightmare-esque features that I wanted. The result was Zenith 4.0, and I am very pleased with it - despite a couple of teething problems, it's the first spinner I've had that's performed how it's supposed to, and not broken itself. Quite to the contrary, at AWS26 I managed to break quite a few other bots with it, getting to the Semi finals, which is the best a spinner of mine has ever done. However, it did have a few problems. The disk how I had it designed originally was too heavy, so I had to remove a section of it. Unfortunately, this weakened it significantly, so the blade was getting bent and deformed every fight, taking the edge off the blow. Also, because of the aforementioned weight issues, I had to do a lot more weightsaving than I would of wanted, including removing the top rear armour. The other main problem it had was the drive - I had used bevel gears in order to make the wheel pods at the front be able to be thinner and therefore leave a bigger unoccupied space beneath the disk. Although this worked quite well, it was very difficult getting them just right, not sacrificing grip or ground clearance, and by the end of the event I had very little mobility at all, so I'll be working out a new drive system before it's next event. Apart from that, I was very pleased with the general shape and design, so will stick with it for now. It was also voted best designed and most destructive at AWS26!